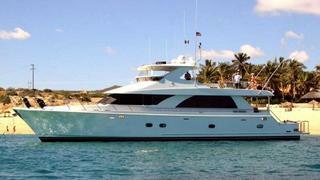 Here's another price cut as Todd Rittenhouse at Ardell sends news of a $300,000 drop on the 24.4m cockpit motor yacht Mick. One of the popular Ocean Alexander 80 range of yachts, she was built in 2006 to a design by Ed Monk with an interior featuring teak joinery accented by burl inserts. Accommodation aboard Mick is for six guests in a full beam master suite, VIP stateroom and a twin cabin while twin 2000hp Caterpillar engines give her a cruising speed of 15 knots. Located in Cabo San Lucas, Mexico, Mick is down from $2,695,000 to $2,395,000.